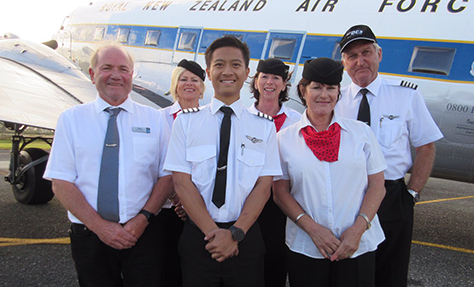 The FLY DC3 New Zealand crew are committed to giving their time….and operating their DC3 in excellent flying condition. With their NZ CAA Commercial Airline licence, they are trusted to provide an excellent service. They have operated this DC3 in New Zealand for over 30 years, from local area scenic flights, flying to concerts, events and airshows, display flights, parachute jumps, filming and photography, aerial burials, and private corporate and ‘family and friends’ charter flights. Their DC3 airliner is able to land at a number of provincial ‘retro’ grass airfields in NZ, and therefore can often also be the solution to specialised charter and filming requirements. Plan ahead for DC3 tickets for the very popular Summer ‘Whitianga Day out’ flights. We fly a DC3 airliner. We recreate flying ‘Back In Time’ ……how it used to be in New Zealand. And around the World. 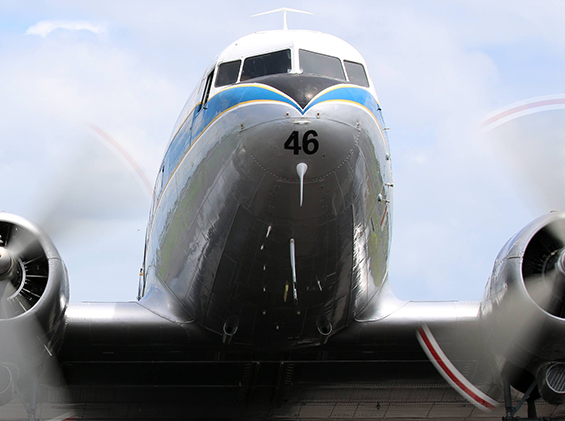 We are a part of a close knit, world-wide group of DC3 owners and operators. We have operated this Classic DC3 in New Zealand for over 30 years, from local area scenic flights, flying to concerts, events and airshows, display flights, parachute jumps, filming and photography, aerial burials, and private corporate and ‘family and friends’ charter flights. The DC3 airliner is able to land at a number of provincial ‘retro’ grass airfields in NZ, and therefore can often also be the solution to specialized charter and filming requirements.